2009 is almost over so I thought I would write a short review of my year. Judging by my portfolio and resume it was a pretty unproductive year. I spent quite a bit of time on my scale necklace, and I spent some time on some things I have not yet finished, but most of my time this year was spent making things that didn't go in my portfolio. I was only in two exhibitions this year. One of them was Cheongju, which is kind of a big one, so that makes me feel a little better. I only entered a few others, and got rejected from them. There were several exhibitions or competitions I didn't enter, Niche, Materials Hard and Soft, CraftForms, Mesa Contemporary Crafts. 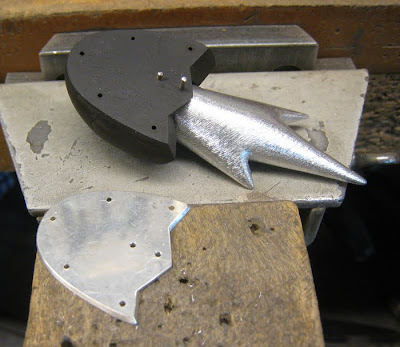 I should be getting some good news about two of my brooches soon (I hope). I really want to say something about it now, but I feel it is bad luck to say anything before it is finalized. 2009 was a good year for travel for me, I went to Iceland and Sweden, then Korea and Japan less than a month later. 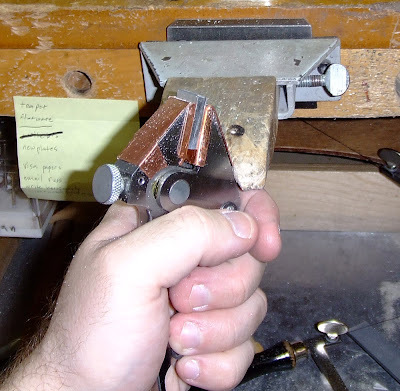 I never mentioned it on this blog, but I spoke with my former employer at Houman Jewelry Design in San Diego a few times throughout the year about going back to work for him. We spoke three or four times, but our timing was always off. It was either me calling him about a job, but he didn't need anyone, or him calling me about a job, but I couldn't go. I love San Diego and want to go back there, but I may be moving somewhere else to take a new job early next year. Most people who know me know about it, but I don't want to announce it here till it is certain. So between considering going back to my old job and applying for this other job, 2009 has felt like my final year in my current life. I hope it is because I am ready to move on. My goal is to finish all my unfinished pieces this winter, but I ended up starting something new last night. It's a lock pick. I make so many lock picks, but they are all the same couple designs. I'm sick of doing these same designs cause I could do so much more with custom lock picks, but most of my customers don't want to try anything new. So I started on one that's totally different from the other designs I have done. 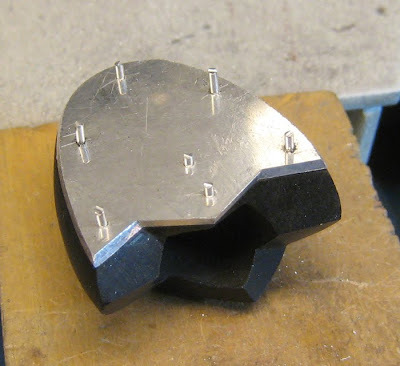 Lock picks don't normally take too long to make, but this one's going to be much more time consuming. 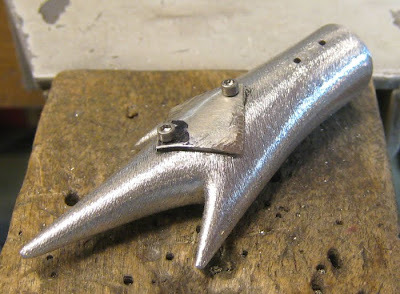 I also worked on the ebony and aluminum brooch. I haven't worked on it much since I wrote about it last cause I had other things to do. Last time I worked on it I finished shaping the aluminum part and put a texture on it with files. Last night I made the sterling back plate for the ebony. I also drilled the holes for the pins (or screws, I haven't decided yet) that will help hold the aluminum part. 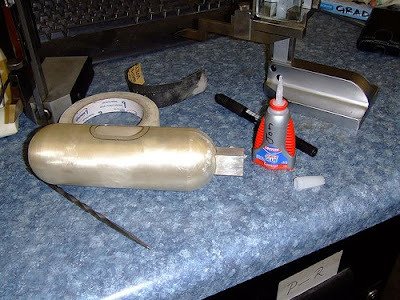 I will also use epoxy to hold the aluminum part. The pins will make it stronger and also hold it in place so I don't need to worry as much about the aluminum piece shifting before the epoxy dries. The plate on the back will be attached with either pins or screws. Which ever I use I will also use some epoxy on them. 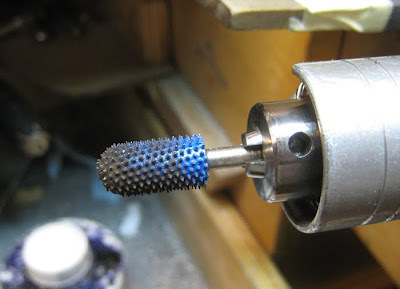 Since you cannot solder to aluminum, I have to use screws to attach the top part of the pin back. It was kind of difficult getting the little sterling plate to conform to the shape of the aluminum. The larger diamond shape drawn on the aluminum is a tracing of the sterling plate. After taking the photo below I burred away the area inside the smaller diamond. Burring away that lump made it easier to fit the silver to the curve of the aluminum. After getting the sterling to fit a little better I drilled holes in it and the aluminum, then tapped the holes in the aluminum. 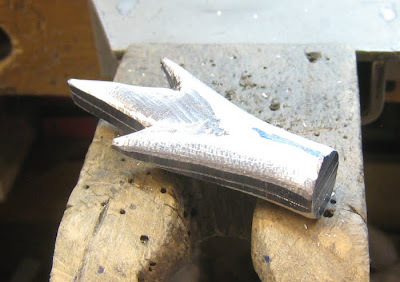 Then I screwed the sterling piece to the aluminum and hammered the sterling directly on the aluminum until there were no gaps between the silver and the aluminum. Next time I work on this piece I will finish making the pin back, make the screws to hold everything together and maybe anodize the aluminum. I still don't know what color to make it. I just added a search box to the right side of the page so I can search my blog. I added it more for myself than for my readers. Yesterday I mostly worked on fixing the problem with one of my pieces that I mentioned at the end of my previous post. It's an issue that comes up with the aluminum occasionally. I don't really understand it and I don't want to talk about it. 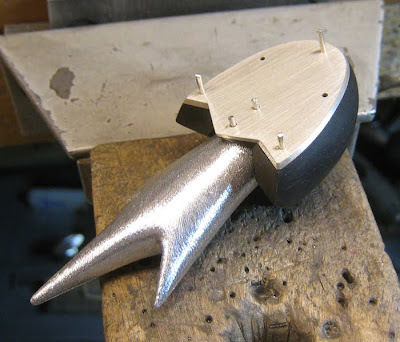 After that I worked on the aluminum and ebony brooch. I continued shaping the aluminum part, drilled a hole in the ebony for the aluminum part, and shaped the ebony part some more. I should have done something different early on in the process that would have made things much easier. Before I started carving the aluminum part I should have put it in the lathe and made the bottom of the thing cylindrical so it would be easy to just drill a hole in the ebony and put it in. Since I just free handed it with my micromotor it's not round. 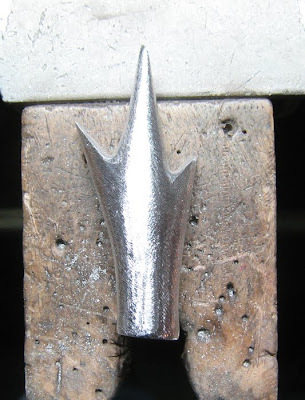 Which means after I drilled the hole in the ebony, I had to use a wood carving bur (pictured below) to try to make the hole match the shape of the aluminum piece. Doing that sort of thing is never easy. And of course what I ended up with was there being a gap between the aluminum and ebony in some places. Now I am trying to figure out the best way to make it look good. I wonder if my explanation makes any sense? Speaking of wood carving burs, I think these spiky ones are so cool. I also like that they come in different colors. But they can totally tear up your fingers worse than any thing else I have experienced. Keeping with my decision to finish all my unfinished pieces this winter, I decided to give up on finish this spoon in the photo below. It's not finished to my standards at all, the casting is so bad I think it would be faster for me to just remake the piece rather than try to fix all the pits. But this piece isn't important enough to remake. I am not sure if I wrote about this spoon at all before, I carved the wax around 2000 or 2001 during my 4 year wax carving spree, and cast it in three parts in 2007. I don't know what happened with the casting, but two of the parts are just terrible. I worked on it for a while and finally put it aside cause I didn't want to deal with it. So now I just want to call it done and not worry about it anymore. I have no plans to photograph it any better than the photo below. Here are some photos of a piece I was working on recently. It will be anodized aluminum and ebony. The design in my sketch book is dated January 2009. I am not sure when I started making it, but I didn't get very far before I stopped. I started working on it again last week. I'm trying to finish all my unfinished pieces this winter. I like this design, so I'm not sure why I stopped working on it almost as soon as I started. 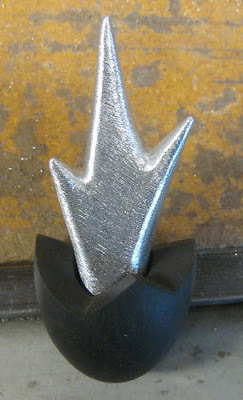 The ebony part was mostly done, but all I had done on the aluminum part was roughly cut it out with my band saw. So last week I started shaping the piece. I like carving these kinds of things, but I am tired of the mess it makes. 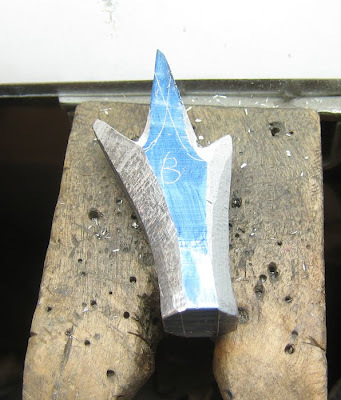 After getting it mostly shaped with burs, I used files to get between the points and smooth out the areas I had burred. 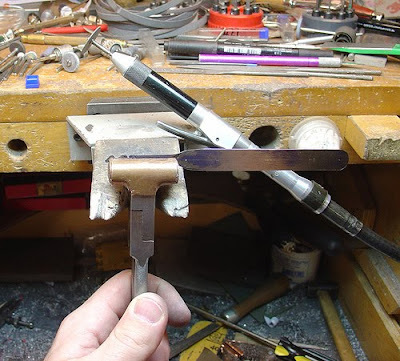 The pliers I am holding the piece with in the photo below are locking parallel pliers. 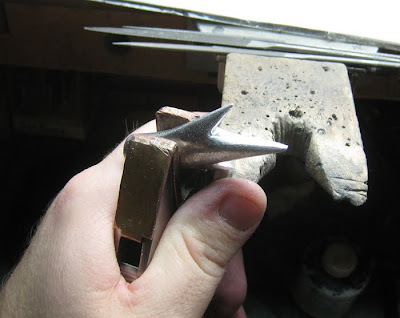 I am a big fan of tools for holding the things I am working on. The shape is mostly done. I still have to refine it. The bottom part is ebony. I did most of the work on that piece when ever it was that I started this piece. I'd like to just get this piece done, but I had a set back with a commission and have to spend some time redoing something on that. I hate having to redo things. I got my scale necklace back from Cheongju a few weeks ago. It had some tarnish on it, so I wanted to clean it before putting it away. It would take forever to try to clean it with silver polish, so I cleaned it with this very fast and easy method. I don't know what this method is called. I heard of it years ago, but never tried it. About a year ago I tried it for the first time cause I had a lot of my old silver jewelry to clean and it worked very well. Put aluminum foil in the bottom of the pot. Put in the silver jewelry. Put some baking soda in the pan with the jewelry. I don't know how much is recommended, but I covered the bottom of the pan. 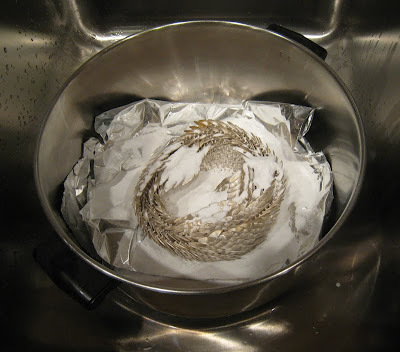 Pour the boiling water into the pan with the jewelry and baking soda. I looked around on the internet for this method and found another person saying to add the baking soda to water and bring it to a boil and dunk the silver in to clean it. Only thing to be careful about is if your jewelry has stones. I would not recommend trying this with fragile stones like opal or turquoise. Diamonds, sapphires, and rubies should be ok. 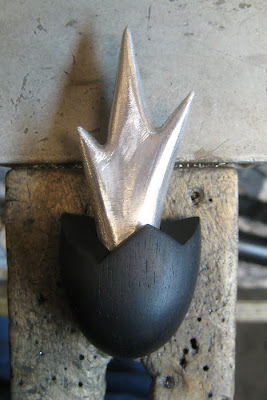 I am not sure what this will do to a patina, for example silver that is black in the deeper parts of the design. I wouldn't recommend trying, unless you have a way to reapply the patina if you ruin it. This only removes tarnish. If your jewelry is gunked up with dirt and hand lotion this won't necessarily clean that off. There are silver dips that remove tarnish. They work well, but they stink. I think this probably works just as well as long as there aren't any fragile stones on the piece. Lately I have had some problems with my black anodizing dye. I hadn't been getting a real black, I was getting dark gray. With the last thing I tried to anodize black I made two attempts but couldn't get anything darker than a medium gray even after a 45 minute soak. So I ordered more black. The stupid black dye is like $30, while every other color is $10. Since I was already ordering I also decided to try a new color, brown. I just got the dyes in the mail today, so I haven't tried brown yet. I've been busy lately and I didn't have time to finish my green enameled bracelet for 500 Silver Jewelry Designs. Two of the pieces I entered were from 2004. 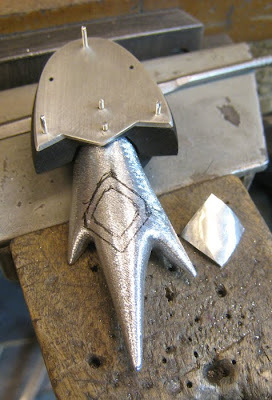 Before I really looked at my portfolio for silver pieces I had been thinking I have done a lot of work in silver. Not really. 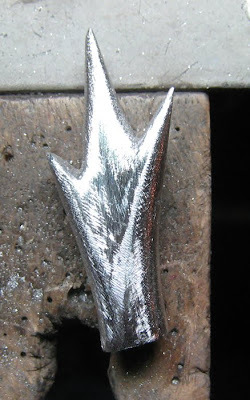 I've done a lot of work that used some silver, but I have made very few things primarily out of silver since 2004. Last night when I went to Lark Books' website to download the entry form for 500 Silver I saw they are doing a book 500 Felt Objects. I have some half finished pieces involving felt and anodized aluminum. I suppose I should finish them and enter, though I don't have much confidence they are going to be the kind of things they want for the book. But since there's no entry fee I'll enter anyway. Entries are due Feb. 13, 2010.